As you’ve already seen on my Instagram account (you don’t follow me there yet?) Last week the iconic Kitty collection by Charlotte Olympia launched and it was with a very special edition of the cute kitties! To celebrate it i got to wear my PoutyKitty in lights green paired with a Zaachila dress. Don’t forget that the whole Kitty collection is available online now! La semana pasada os mostraba en Instagram un pequeño avance de la colección iconica Kitty que acaba de re-lanzar Charlotte Olympia con nuevos modelos y colores exclusivos del divertido gatito que tanto se ha visto durante los últimos meses. Para marcar el lanzamiento de su colección (ya a la venta online) yo elegí el modelo “pouty” en verde claro junto a u vestido kaftan de Zaachila. gala eres lo P___ mas! poco mas que añadir. creo que nos demuestras cada dia que el estilo se puede madurar y renovar y innovar. eres una maquina! Originales fotos, expresión y sobre todo bailarinas!! Para un look sencillo para destacarlas, no puede ser de otra manera! Wow amazing dress and the kitty flats are so cute. Beautiful! Loveee the shoes and the whole outfit. Gorgeous! Un look perfecto con ese vestido! Los zapatos ideales! These shoes are really cute, love the way you matched it!! Don’t hesitate to visit my blog!! love love love the kitty flats! someday I buy myself a pair of them. by the way this dress fits you perfectly! Me ha encantado las bailarinas! Son monísimas las de gatitos!! Te dejo mi nuevo post. Cumpleaños Personalizados. Hoy Toy Story! Perfecto! Las Charlotte son lo mas! those shoes are totally cool! want them! Charlotte Olympia makes the most adorable slippers ever! 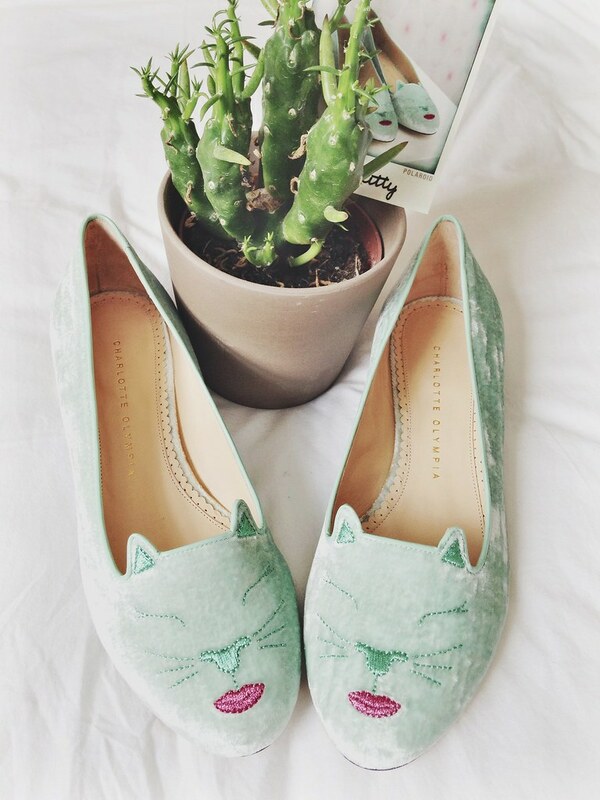 I never thought I’d want a pair of cat flats, but these are just too good! Very nice and perfect shoes. I love them! I’m looking for something like that for this fall. But i’d rather have a more neutral colour. Have a look to my blog where I write about luxury-fashion and cosmetic brands and their latest activity in the media, and digital landscape. Beautiful look! The dress and flats combo is purrfect! Gorgeous dress and shoes! Love this look! Nos encantan las parisinas! qué monada! You are the only one that can pull off that dress. The slippers are very cute. I love your Mexican hand embroidered dress! it is gorgeous!! We are super fans of your blog. Your pictures and style are inspiring. Warm regards from Mexico!